I have been planning several 2018 weddings lately, and the topic of welcome parties keeps coming up… which made me realize this would be such a great, informative topic for this blog! I always want to be a source of knowledge, inspiration, wisdom (as both a recent bride and a longtime wedding planner), encouragement, and brimming with insight as you plan your wedding. And now I’m here to convince you why you, too, need to have a welcome party the eve of your wedding day! A welcome party traditionally follows your rehearsal dinner, and it’s open to all wedding guests. I feel like welcome parties are becoming more and more mainstream and, quite honestly, a must for your wedding weekend. And I couldn’t agree more, especially thinking back to our superb welcome party! For our wedding, about 80% of our beloved wedding guests were traveling from out of town. We have zero family in Raleigh/the Triangle, and all of our families, and many of our friends, were traveling from afar to join us for our wedding weekend in Raleigh. 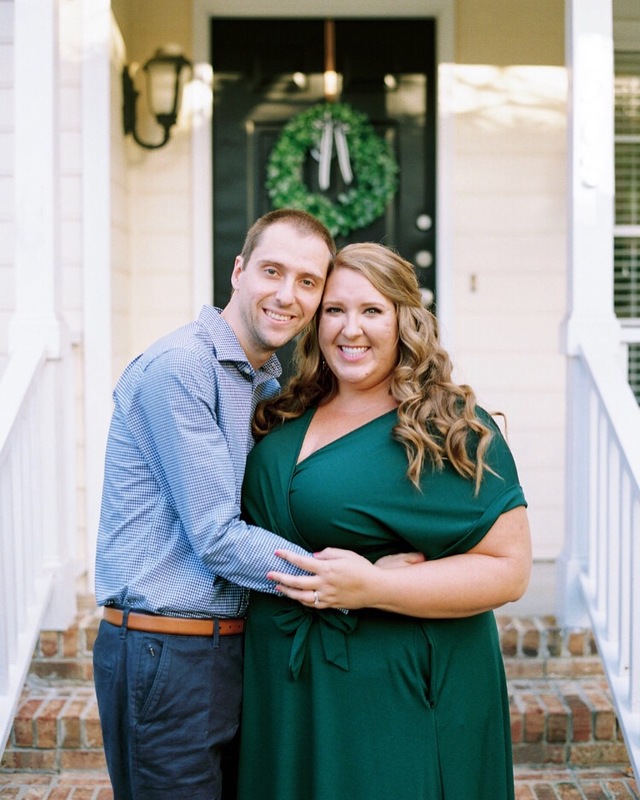 For a plethora of reasons, we immediately decided that hosting a welcome party was a must for our wedding weekend, and it was one of the best decisions we made! We wanted to spend as much time as possible with those we love the most, and this was the perfect opportunity to do so. I hadn’t met all of Rob’s (large) extended family, he hadn’t met many of my best friends from DC, and we wanted to soak up this precious time for as long as possible. Plus, it would give all of our wedding guests another opporunity to see us and to see family/friends that they, too, hadn’t seen in a long time! Family is everything to us, and we wanted to show them how much we love them by inviting all of our guests to a welcome party. Our rehearsal dinner and welcome party were in the same private room at the Angus Barn in Raleigh, arguably Raleigh’s most well-know, premier, quintessential spot for special occasions. From the beginning, the Angus Barn was abolsutely the perfect spot for these celebrations, and it was an easy choice to host our rehearsal dinner and welcome party here. The Angus Barn made it so easy from start to finish, and we loved having part of our wedding weekend events here! It’s a very special place, in particular, to Rob’s family, and it’s also where we celebrated our engagement with both sets of parents. Plus, have you had their chocolate chess pie? It’s extraordinarily heavenly!! We (and by we, I mean Rob’s incredible parents!) hosted our rehearsal dinner from 6:00 – 8:00 on the Friday before our wedding, and then we opened up the event from 8:00 – 10:00 to all of our wedding guests for the welcome party. For the entire evening, we were celebrating our upcoming nuptials with those who love us the most, many of whom traveled great distances to be there to celebrate us. It was an endless stream of family and friends, and we estimate about 110-120 of our guests were able to make it to our welcome party! It was a preview of what was to come the following day, and it was surreal to have so many of our family and friends in one room. I remember smiling and talking nonstop for hours on end, and I never wanted the evening to end! We provided appetizers, a groom’s cake (Buffalo Bills, of course! ), and an open bar for the welcome party, and it wasn’t too much of an additional cost to extend the rehearsal dinner by a couple hours. The Angus Bar made it so easy for us, and hopefully any venue would do the same. We had the same room reserved for the four hours, kept the bar open the entire time, and the appetizers were refreshed during the course of the night. And I cannot emphasize just how fun, meaningful, and worthwhile it was to continue the celebrations past our rehearsal dinner and see so many of our family and friends on the eve of our wedding! It definitely took the pressure off of meeting and talking with every one of our (close to) 200 guests during our wedding reception, it povided us with a more intimate opporunity to catch up, talk with, and even meet our family and friends, and it was such a celebratory evening full of so much joy, excitement, and anticipation! On a logistical note, we included information for our welcome party on an insert card in our formal invitation suite. We wanted to ensure every guest knew how much we would love for them to join us on Friday night for a welcome party, and we wanted to ensure everyone knew it was an open invitation for ALL wedding guests. We didn’t ask for RSVPs, and I never thought we needed to… we wanted it to be a casual, drop-in type event for anyone who could make it. If you’re a bride-to-be, have I convinced you yet?! I sure hope so! I cannot emphasize just how much fun and wonderful our welcome party was, and I know so many other couples who feel the exact same way. It was such a minimal additional cost (a huge thanks to Rob’s parents for generously paying for it, though!! ), and it was the most incredible way to spend our wedding day eve! I’d strongly, strongly encourage everyone else to consider hosting a welcome party for their own wedding, too! < Previous Meet my newest intern, Lea!